There is no question that John Moyle was a valiant pioneer, a hard worker and a gifted stone cutter. The problem I have is that the LDS Church cannot help but twist a great story and make into a lie. Either that, or they need to check their facts. 20 Miles or 26.3 Miles? 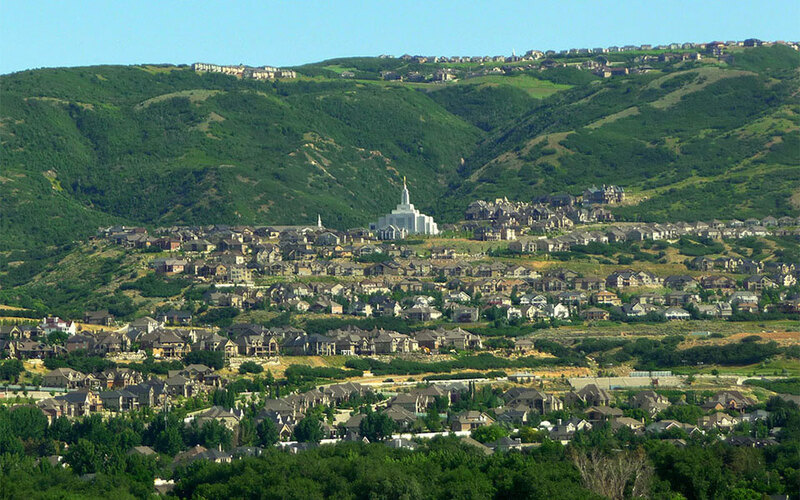 The lesson says that Moyle walked 20 miles to get to the temple. Walking 20 minutes / mile that would take 6 hours. OK Maybe. 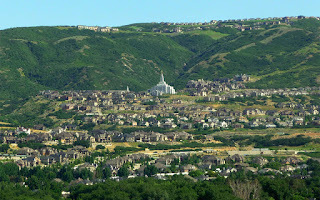 A Deseret News Article says Moyle walked 22 miles, leaving at 2:00 AM to arrive at work at 8:00 AM. If it is 22 miles in 6 hours that is about 16 minutes and 20 seconds per mile. OK.... Walking pace for someone super fit. But the 22 miles is "As the Crow Flies". The reality is that using today's roads, the shortest distance to the Salt Lake Temple it is 26.3 miles. Just more than a marathon. When you look at the photo above showing the Draper Temple, you realize why you can't to a straight path. Alpine is on the back side of that mountain. The area is super mountainous, and today is a mountain biking haven. See image at the bottom. So why does the lesson manual say 20 miles when it's really 26.3 miles? 20 miles is perhaps digestible over mountain roads, across creeks, over dusty paths, but 26.3 miles is not. They are avoiding investigation. 26.3 miles in 6 hours would be 13 minutes 30 seconds / mile. This for a 50 - 70 year old, who then would work a very physical 8 hour day. Again, there is no question that John Moyle was a tough guy. A classic pioneer in every way, but the lesson tells about his leg being broken and then implies that he kept working in the same way he always had. A talk by Elder Dieter Uchtdorf in 2008 said, " In spite of the crude surgery, the leg started to heal. Once John could sit up in bed, he began carving a wooden leg with an ingenious joint that served as an ankle to an artificial foot. Walking on this device was extremely painful, but John did not give up, building up his endurance until he could make the 22-mile (35-km) journey to the Salt Lake Temple each week, where he continued his work. " according to this article he was 77 years old at the time. Is Uchtdorf really saying that at age 77 that Brother Moyle made the 22 miles (26.3 mile?) journey to the temple on a crude wooden leg? John Moyle was born in 1808. He turned 77 years old in 1885. Not only is it extremely unlikely that a 77 year old with a crude peg leg could walk 26 miles, it is even stranger that nobody thought to loan him a horse or buggy or that the LDS church didn't provide transportation for him. 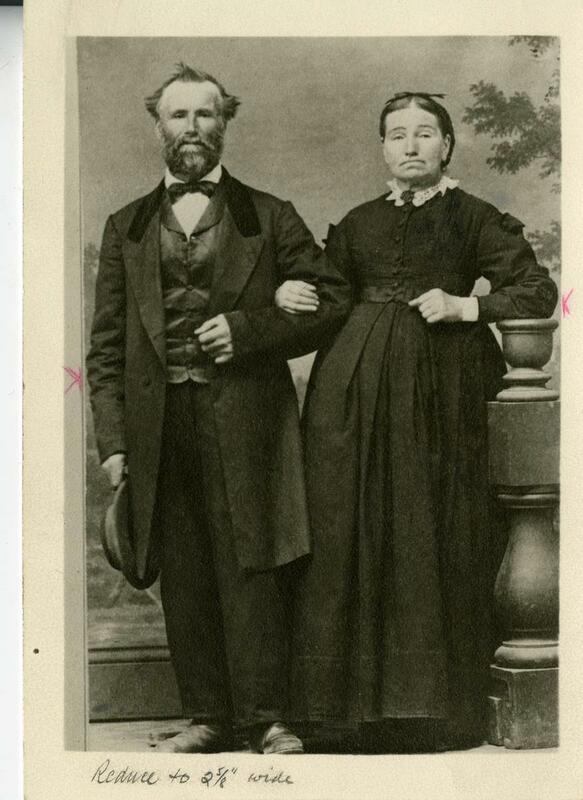 By 1872 (15 years before his peg-leg adventure) there was a railroad going from Lehi to Salt Lake City. Source Why didn't he walk the 8 miles from Alpine to Lehi and catch the train? John Moyle seems like a great man. He did so much, provided for his family and left a great legacy of faith. Unfortunately embellishments have made his story seem like a myth and diminish his greatness upon inspection. Edit: The Wheat and Tares site did some additional research on this work and for the most part confirmed my conclusions. You can read their work here. I have questions about the provenance for the story of John Rowe Moyle the stonecutter found in the current Church History Primary Manual as well as a 2008 talk by Elder Uchtdorf. 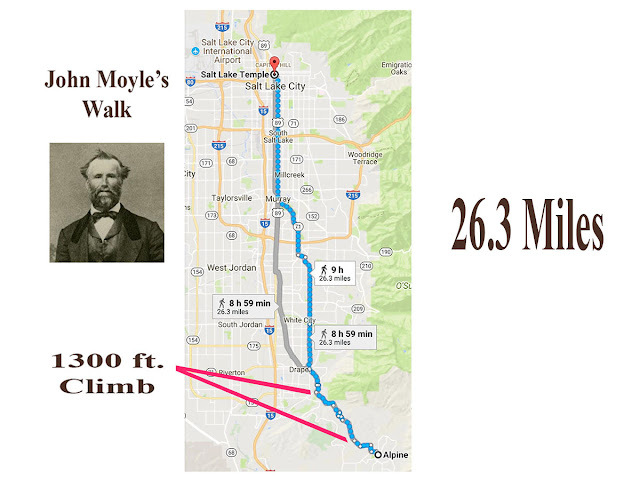 As it is found in the primary manual lesson #44 it implies that Mr. Moyle walked between 20 - 27 miles many times from Alpine, Utah to Salt Lake City to work on the temple, and then after a leg amputation, he continued to make the same commute week after week. For multiple reasons I found the story false as written. It is unfortunate that a great pioneer like Mr. Moyle has his life made into folklore rather than fact, and that it is printed in a document called "Church History". Where can I go, or who can I contact to discuss this issue, and am I wrong in trying to point our errors in the Church History Manual? injured his leg and the favorably known physician of Provo, Dr.
Pike, had done his best to save the leg but gangrene had set in. The second story involved his work on the Temple. On one of these occasions when he had returned home for the weekend, he was taking care of milking his cow when, perhaps impatiently or with his hands too cold, or being too rough, he hurt the cow and she kicked him and broke his leg. It was a nasty fracture of a compound nature and the bone stuck through the flesh. In those days there was not much that could be done for people in the way of anesthesia even though they decided the only thing they would do under the circumstances was to cut off his leg. The story goes that they gave him a big drink of whiskey and a leaden bullet to bite his teeth on, tied him to a door and then with a bucksaw, 203 sawed off his leg, bound the flesh over the stump and allowed it to heal. It is a wonder he didn't die of infection, but the Lord blessed him and the would healed over. while it was healing, he got himself a piece of wood and carved out a peg-leg. He fastened some leather to the top of the wood, padded it and fitted it to his leg. As soon as the wound had healed sufficiently, he walked around the farm on that stump until he was able to stand the pain and had formed a callous over the stump. when it had healed, he walked into Salt Lake as was his custom to take up his work, for he had been called as a work missionary on the Temple. And there, the story goes, he climbed up the scaffolding on the east side of the Temple and carved "Holiness to the Lord," as his contribution to the Temple building. Mother told me that great grandfather was a very skilled mason, much more skilled than some and hence grandfather, who was then superintendent of the masonry work on the Temple, asked him to carve the stones which made the spiral stone staircases in the corners of the Temple. This required meticulous cutting and couldn't be trusted to ordinary stone cutters. 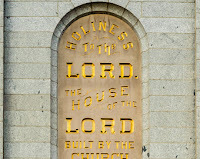 Mother said this was his major contribution to the construction of the Salt Lake Temple. These are the stories, as I remember them, from family tradition.